Bluewater Maribago is a 4 star beach resort with one of the best beaches in Mactan. We find this resort very good for people who prefer an all-inclusive experience within reach. 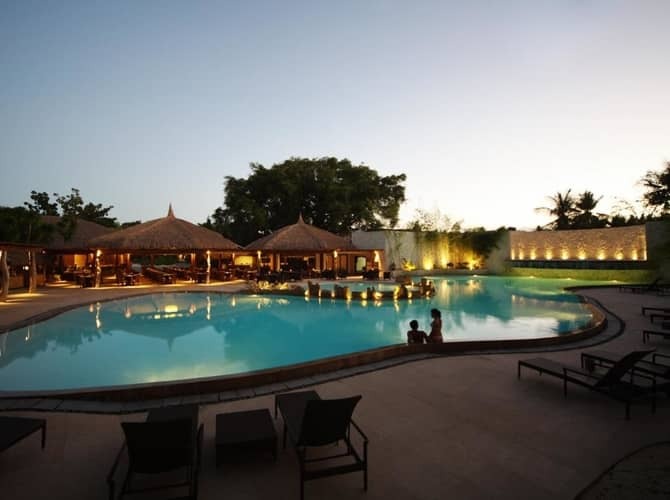 There is 3 pools, and 4 restaurants, a show every evening, extreme water sports, leisurely beach activities, and playgrounds and lots of activities for children, all 20 minutes away from the airport. The resort is exclusive, and only lets its guests and club members use its facilities, which creates a relaxed and secure environment. 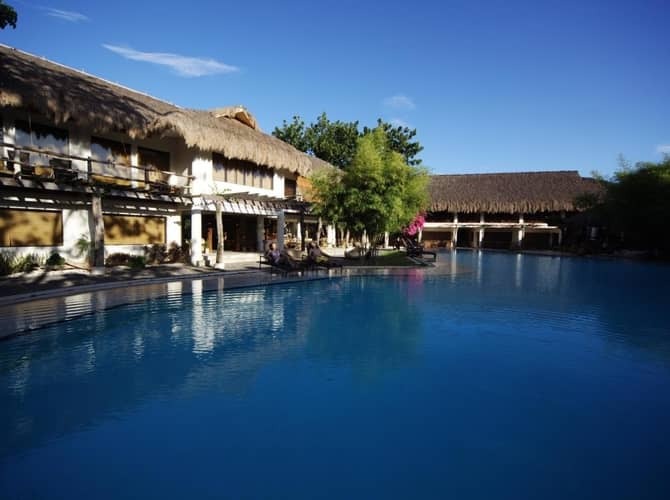 Bluewater Maribago Beach Resort sprawls over 8.1 hectares, and is built like a small village. Meaning, there are no high rising buildings, which makes it perfect for guests who prefer a more natural and cozy ambience. 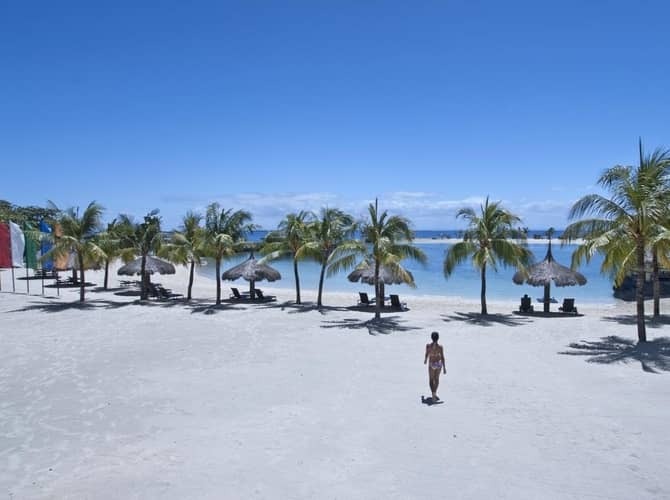 This vast area also includes one of the biggest private beaches in Mactan, so it easily facilitates all of the guests even when the hotel is at its full capacity. 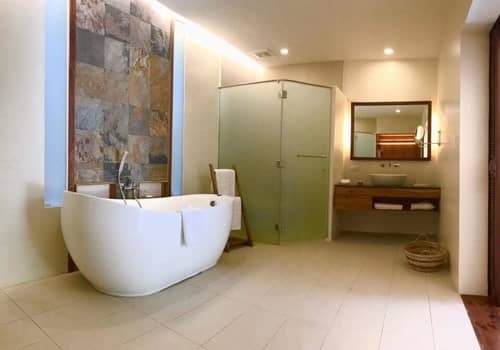 All of these make Bluewater Maribago is fairly more expensive than other 4 star resorts in Mactan, but it will surely grant you a very good experience without the need of leaving its quarters. The staff in Bluewater Maribago is friendly and hospitable, the way it should be in a Filipino owned resort. However, we got some complaints about the management inefficiency, and even though they are rare, they're impossible to ignore. The resort is clean and very well maintained, and we found cleaning staff everywhere we visited. 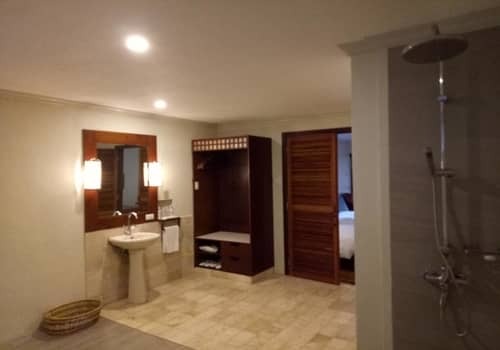 The rooms are spacious and well facilitated, but for a resort so suitable for families not to have a family cottage or divided rooms is strange. Moreover, there is no WiFi in the rooms, and that's a huge downside. The 3 pools are large, well designed, and clean with plenty of chairs and beds. The white beach is the biggest private beach in Mactan, and it's also very well maintained with shades, beds and chairs. However it closes at 05:00pm every day, which is a shame. Located 20 minutes from the airport, and 40 minutes from Cebu City's center we find it very well located. It's about 2km from the bar area in Mactan. The resort itself is very quiet as there is a long distance between the main road and the guestrooms. 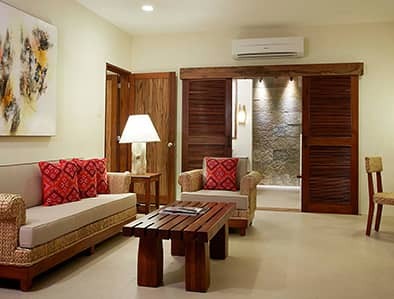 We find it much more expensive compared to other 4 star beach resorts in Mactan. However, it has much better beach then its counterparts, and a very good location. It's also built low spaciously, which gives it a relaxed village ambience. It took us quite some time exploring this resort because it is very big. 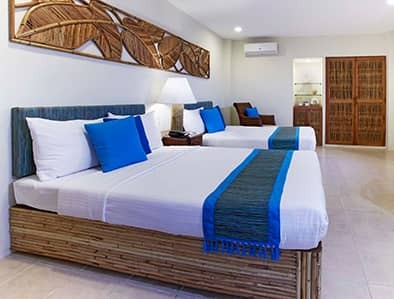 Bluewater Maribago has 174 guestrooms, and all are built low. There are 4 different types of rooms that are spacious and modern in design. 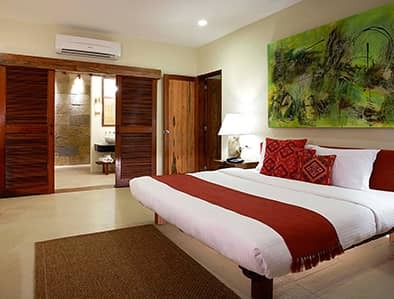 The Deluxe rooms located in the garden wing, the Amuma Spa Suites in the spa wing, and the Premier Deluxe and Royal Bungalow situated just in front of the beach. 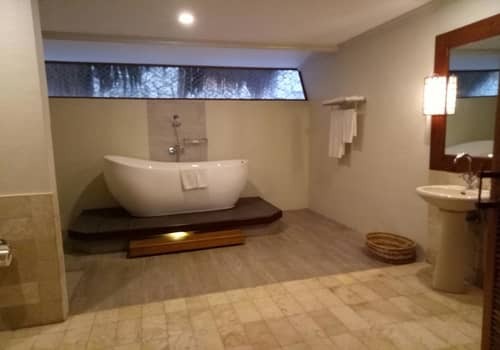 All rooms are equipped with: split type AC, LED cable TV, minibar, shower & bathtub, coffee and tea facilities, private veranda, and a telephone. There isn’t WiFi in the rooms but only in the main restaurant of the Resort. 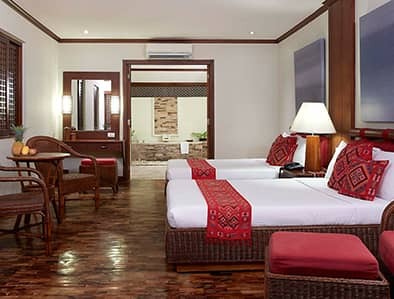 The modern design of the rooms creates a spacious and relaxing ambience, and most rooms can accommodate up to 4 people. 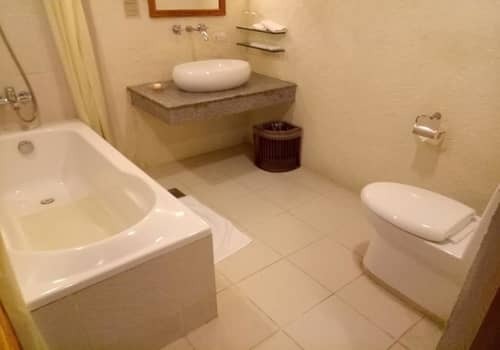 Even though the resort is built low and spreads over a vast area, somehow all of the rooms are facing the communal spaces, disturbing the privacy of the guests. 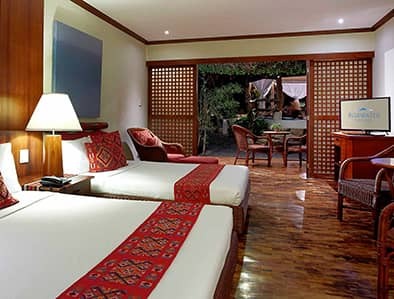 Bluewater Maribago Beach Resort is also very popular with families, of local and international tourists alike. So if you’re a couple who’s looking for intimacy, you might fee out of place. Bluewater Maribago has great facilities, to keep guests of any age entertained. 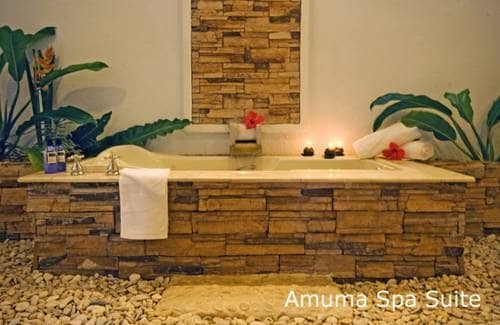 The Amuma Spa is recognized for its quality among local crowds, using only the best homegrown products, and offers Asian and Western welness treatments by highly trained masseuses. 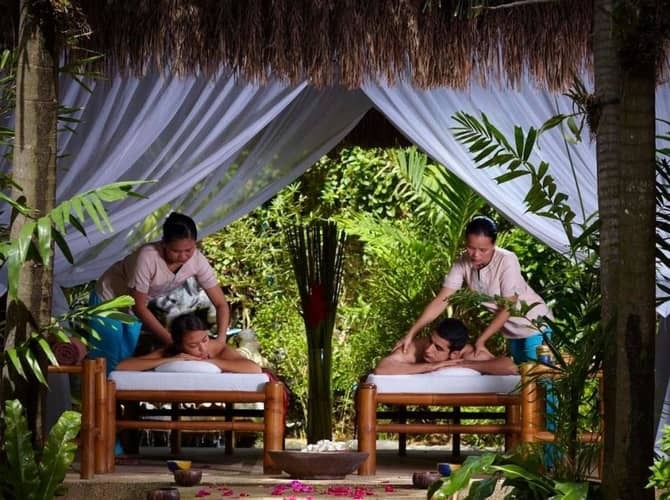 Spa treatments begin at 10:00am until 12:00MN, so guests can enjoy a pampering massage until very late in the evening in the treatment rooms or in the outdoors Amuma pavilion. The resort also have a gym, but it’s a little small and outdated. However they do offer sessions with a personal trainer, as well as Zumba and yoga Classes. 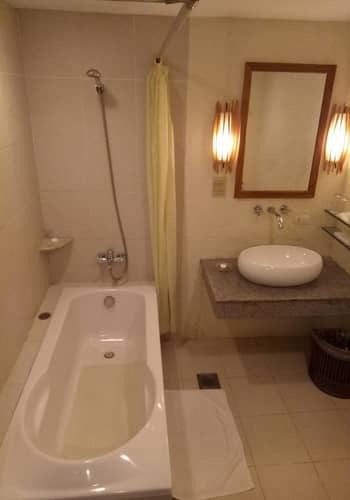 Besides, all guests can enjoy the Jacuzzi and steam bath as well. The house restaurant is called Allegro, a 24-hours Italian restaurant that also serves the daily complimentary buffet breakfast. The reviews of the breakfast are praising, and people say there are plenty of choices of continental and Filipino dishes of very good quality. There is another Italian bistro, with a brick oven that specializes in pizzas and oven baked dishes. 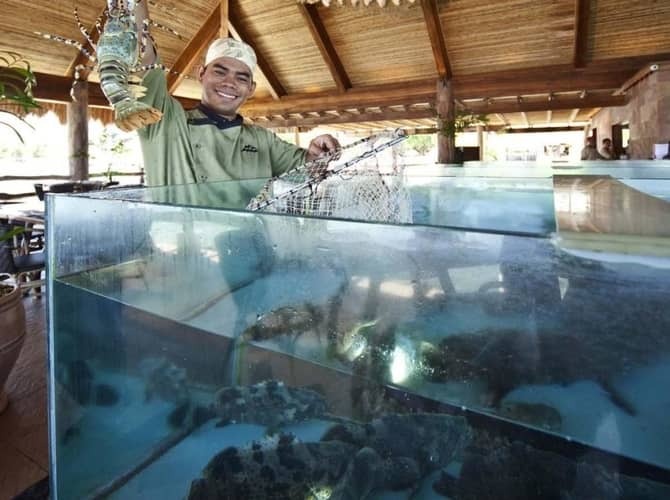 The most expensive restaurant is the Cove, a seafood restaurant located on the private island of the resort, and mimics the local concept of Dampa, or wet-market. There are many aquariums in the center of Cove, where you get to choose the fish you’re about to eat. Ocean fish, lobsters, oysters and clams are all on the menu. There is a smaller seafood menu available in the Oyster Bar which is located on the bridge between the beach and the private island on which the Cove is situated. Bluewater Maribago’s management don’t let their guests get bored even for one second. Dinner is always accompanied by a live show, and each night there is a themed buffet inspired by different parts of the Philippines or Asia. On Saturday nights there is a live and fascinating cultural show to compliment your Filipino experience. Do Guests Like Bluewater Maribago? In general the reviews of Bluewater Maribago are favorable. Most of the unsatisfied guests complained that it's a families' resort which flawed their experience and service. We are very careful with where we send our clients, and we believe that most of the complaints could have been prevented if only those people were well informed. 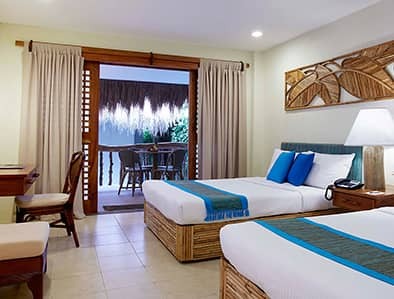 Moreover, Bluewater Maribago is not so strong at troubleshooting, and that's very noticeable with their reluctance to respond and deal with online complaints. 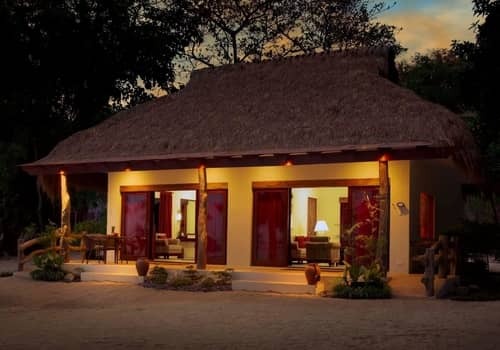 The same goes for guests' problems at the time of their stay, as many of the online criticism is about the inefficiency of the resort's staff to deal with guests complaints or requests. Being one of the most popular resorts in Mactan, going through the thousands of reviews and comments online was quite gruesome. However we do like to give you a better picture of what guests thought about their stay in Bluewater Maribago. 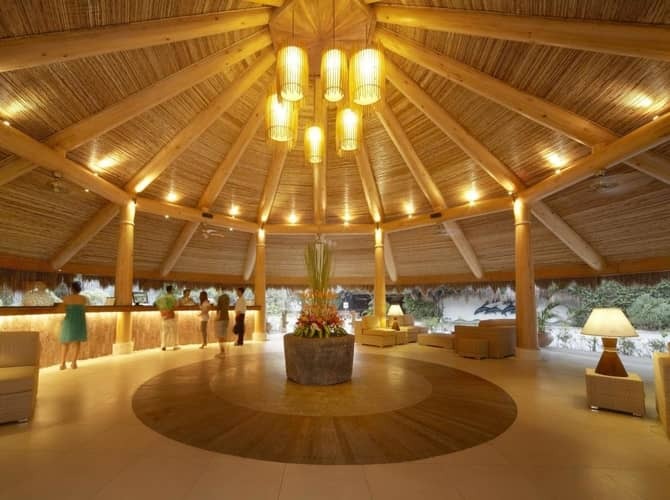 It's the #9 resort in Mactan by Tripadvisor, and it got 4/5 average of 1,058 commenters. As mentioned before, most of the guests who gave it an average and below were solo travelers or couples. People seemed to love the rooms and food. Bluewater Maribago holds the rating of 7.9 both in Agoda and Booking.com, with 2,155 and 383 reviewers respectively. Here the majority of the complaints were about the price, and the outdated rooms. Most people loved it however, and 84% said they would recommend it to their friends. Bluewater Maribago has a highly developed aqua sport facility they call Aquamania. It’s located just by the 110m private white sand beach. 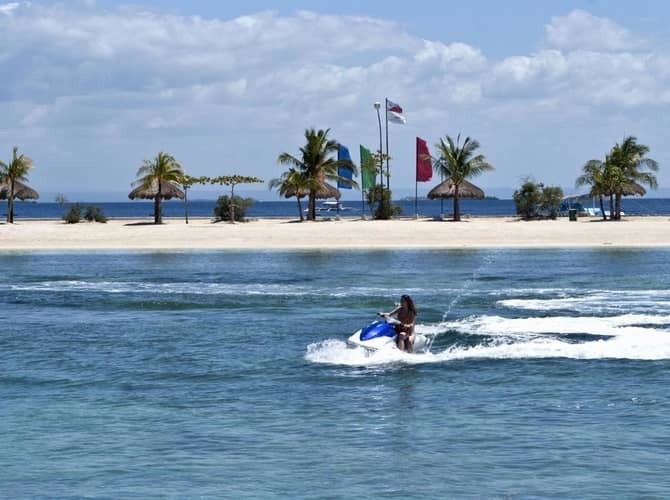 It offers Jet Ski rentals, kayaking, snorkeling, island hopping, banana-boat, and even in-house diving. Besides, there are many other leisurely activities you can enjoy on the beach or its vicinity: billiard, badminton, foosball, and volleyball. Children also have a lot to do in Bluewater, and can enjoy the kid’s playgrounds, watch and take part in the daily fish feeding (there are 3 baby sharks in the resort that need to be fed), and enjoy the beach and its facilities. The resort also organizes day tours that families can enjoy together. If you want to enjoy just you and your significant other, one of Bluewater’s nannies will watch over your children while you have fun by yourselves. Of course you can just relax on the white beach drinking a cocktail, or bathe in one of the 3 pools. The beach is well maintained and has white sand (which is brought there, because it’s not native to Mactan), and plenty of beach beds and shade. 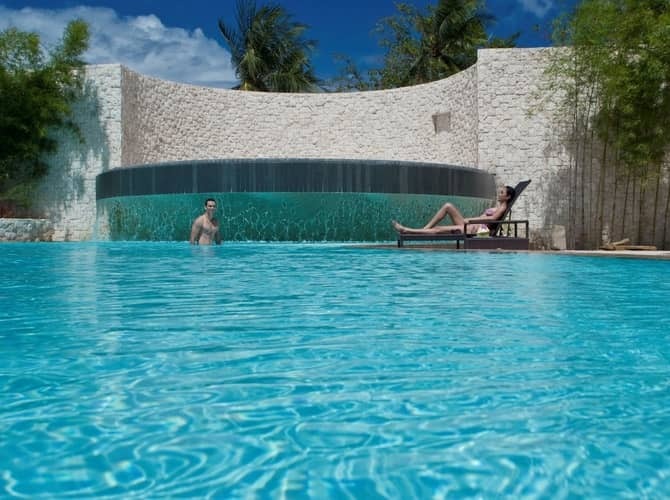 The pools are beach inspires in shape and design, and surrounded by tropical vegetation that projects tranquility. Bluewater Maribago offers a great all-inclusive beach experience just 20 minutes from Mactan’s Airport. There is a lot of variety for you to choose from, from dining options, to wellness spa treatments, and extreme water sports and beach bumming. 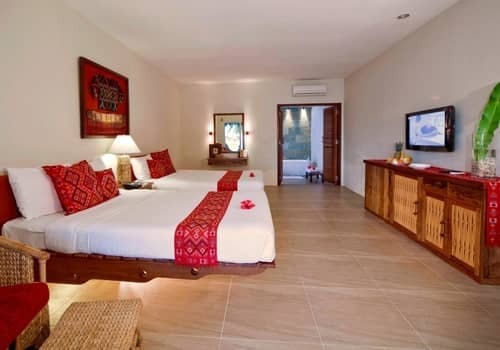 It is also family friendly, and therefore a frequent choice of guests with children. Even though it’s more expensive than other 4 star resorts in Mactan, it does have the best private beach in the island, and a unique ambience due to its low built architecture. 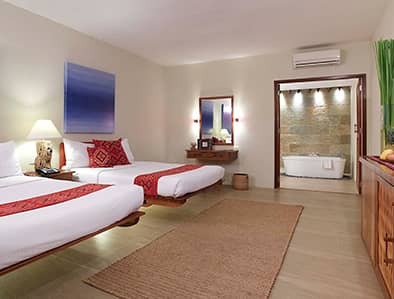 These are the more affordable rooms in Bluewater Maribago. They’re 39m2 each and come with either 1 double bed and 1 single bed, or two double beds, or one king size bed, according to availability. They’re located in the garden wing surrounded by century old acacia trees, and have an excellent sunrise view. These rooms are located in the spa wing, and their veranda is facing the Spa Pavilion, a lagoon style pool and a small tropical garden. They’re a little more spacious (42m2), and have a nice little feature, an additional al fresco shower. This room comes with a king size bed or 2 double beds (according to availability). 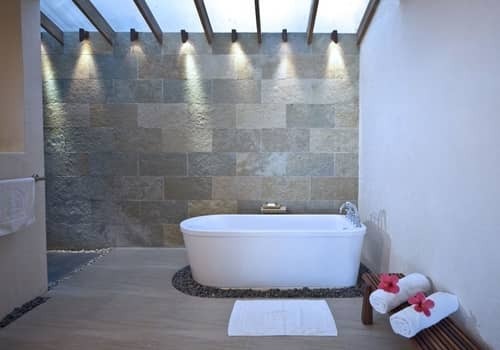 In our opinion these rooms offer more privacy than the rest of the rooms in the resort. These are the newest rooms in the resort that were completed on 2017. The design is matching the existing one of Bluewater, yet you can feel that these are just newer. The come with a king size bed or two double beds (according to availability), and are actually the smaller in size of all the rooms (36m2). But being located on the waterfront is the thing that makes them the second most expensive room. Keep in mind that the beach serves all 174 rooms, and therefore being beachfront can disturb your privacy. These are the most expensive and the biggest rooms in Bluewater Maribago (66m2). They come only with a king size bed as it is designated for couples, yet if you’re a small family you can request additional single beds. 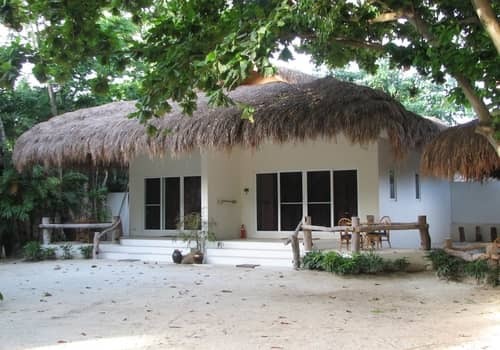 The Royal Bungalows are located on the best location on the white sand beach.